In the strike-shortened 1982 season, straight-on kicker Mark Moseley made 20 of 21 field goals, a then-record 95.2 success rate, and he became the only kicker to ever win the Associated Press NFL Most Valuable Player. Moseley won the Most Valuable Player Award during the strike-shortened 1982 season. 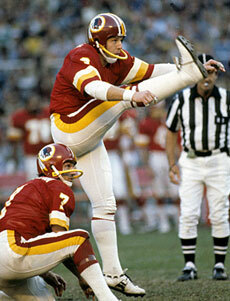 In the Washington Redskins’ 27-17 victory in Super Bowl XVII over the Miami Dolphins, Moseley kicked two field goals and was successful on all three of his extra point attempts. During the following season, he led the NFL in scoring with 161 points. In 1986, the 38-year old Moseley was released by the Washington Redskins mid-season. He remains the Redskins’ all-time leading scorer with 1,207 points. He signed with the Cleveland Browns and retired at the end of the season, helping them win their divisional playoff game against the New York Jets with a game-winning field goal in double overtime. In his career, Moseley was successful on 300 out of 457 attempts (65%), successful on 482 out of 512 extra points attempts (94%) and scored a total of 1,382 points. Davis was a major part of LSU's national championship season of 1958. 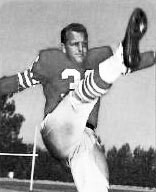 Tommy Davis was a big reason why LSU won the national football championship in 1958 (Davis passed up his final year of eligibility to sign a professional contract with the San Francisco 49ers). In the 1958 championship season, his place kicks provided the winning margin in two games (10-7 over Florida and 7-6 over Mississippi State), and his booming punts assured great field position for the Tigers throughout the season—an essential ingredient in Paul Dietzel’s conservative style of play. An 11th-round pick in the 1957 NFL Draft, Davis set a league record for 234 consecutive extra points. He made 348 of his 350 extra point attempts before he retired in 1970. 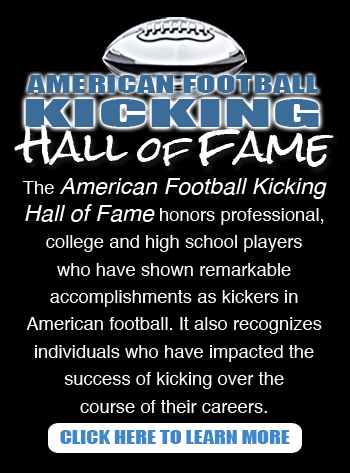 In addition to his NFL record for consecutive extra points, Davis ‘ lifetime punting average of 44.7 yards is among the top 15 in pro football history. Davis was elected into the LSU Sports Hall of Fame.